What the james bond films don’t show are the hundreds of other spies that are killed each year from their own deadly gadgets. I mean they don’t seem to get much training with them. Just a quick 10 second demo at best. They should at least include a little booklet or something to read on the train. Such a waste. A very disarming comic that was. ho ho. Based on this comic I can say with the utmost certainty that Biff is nothing more than a rubberized mannequin which has miraculously gained consciousness. Either that or he managed to hollow out his entire body leaving nothing but the invisibly-reinforced skin. Both theories are pretty much equally possible. Of course, he could also just be a nonsensical webcomic character whose physical structure is altered according to the demands of the current comic’s joke, but that theory’s just boring. They did try to give bond a manual once he used it for target practice. Yeah, the worst spy gadget I heard of was the combination suicide pill/toothbrush. The only advantage was going out with a bright smile. I’ve never watched James Bond movies. I think I may have to, just to accompany this week of Biff. Ooh, idea! Press the Emergency Arms button… attach a spare head next to the current head… TA-DAH! Zaphod Biff-lebrox! Actually, Biff is defined as a “pen-and-paper drawing” as of http://www.thebookofbiff.com/2006/01/20/elevator/ (the 9th strip). 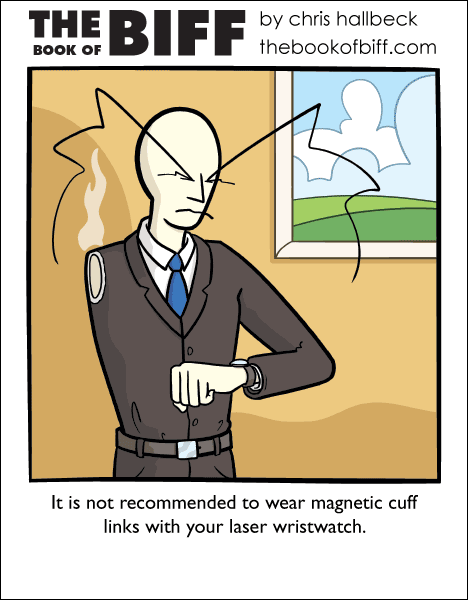 And the joke is that Biff had his cufflinks attach to the watch, which was firing a laser out of its face. Arm attached to laser source = classic Biff.